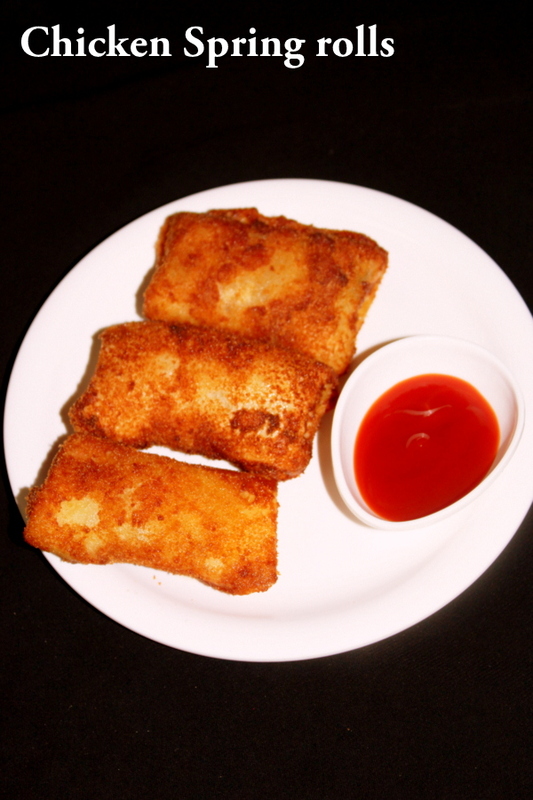 Chicken spring rolls recipe, an indo chinese snack recipe in which chicken stuffing is filled inside a spring roll sheet, rolled and deep fried. 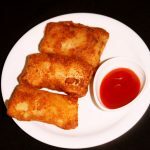 Chicken spring roll here is made keeping in mind the month of Ramadan where we need many snacks recipes and ideas to make during the month of ramadan. It is a very auspicious month and I would like my viewers to go through this recipe for special iftar snacks recipes as it is one of the best recipes that can be made for ramadan. To make spring rolls we need vegetable stuffing and chicken added into it. I have shared the procedure of stuffing as well as the procedure to make chicken spring rolls sheets. Here, in this recipe I have made home made spring rolls sheets, these can be made at home quite easily but I would also suggest that these sheets are readily available in markets and need not spend lots of time in making spring roll sheets at home. In this recipe, the spring rolls are dipped in beaten egg and coated with bread crumbs but this step is completely optional if one buys ready made sheets to make chicken spring rolls. The sheets that are made at home have to be made very carefully and there are chances of the sheet breaking while stuffing and sealing. If one is making them in Ramadan, I would suggest to buy the sheets from grocery stores and then just make chicken stuffing or vegetable stuffing at home, add the stuffing into the sheets, fold and seal them and they are ready to be deep fried. Chicken spring rolls is a wonderful snack delicacy and one should learn the art of folding and sealing the spring roll sheet and if this art is learnt, it is easy to make spring rolls be it veg or non veg. I have made spring rolls for the very first time and they turned out very well and shall soon be uploading other spring rolls like veg spring rolls as well. 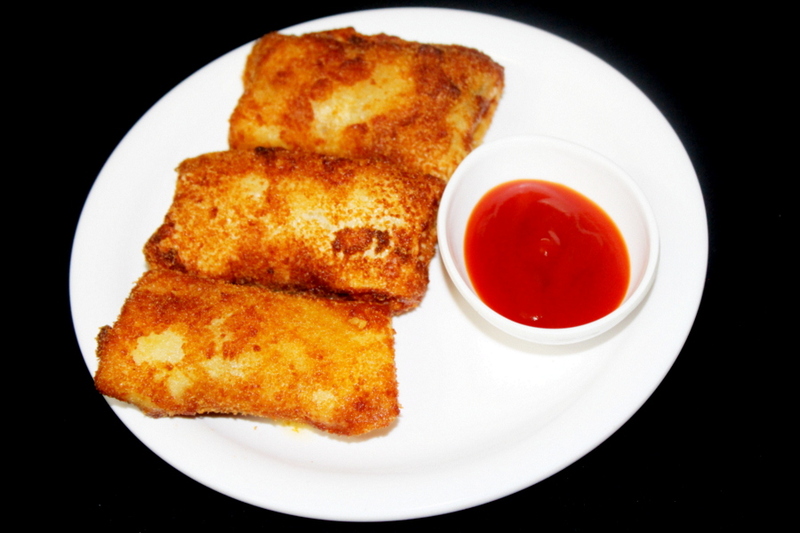 This is an Indo chinese snack recipe where I have made some variations to the recipe such as dipping in egg and coating the roll with bread crumbs. This is a deep fried snack recipe where it takes in lots of oil and one should strain the rolls out before eating as the rolls will have absorbed lots of oil. It is better to use an absorbent paper such as tissue paper and place the rolls on the sheets for a while until all the oil from the spring roll is absorbed. Doing so helps in removing excess oil from the rolls completely. Here, the chicken is first boiled with water, chicken and turmeric water. The chicken is then shredded and used in the stuffing by making use of some shredded veggies, cooking them along with chicken and sauces. The stuffing should be focussed well as the rolls are totally tasted delicious only if the cooked stuffing is yummy. 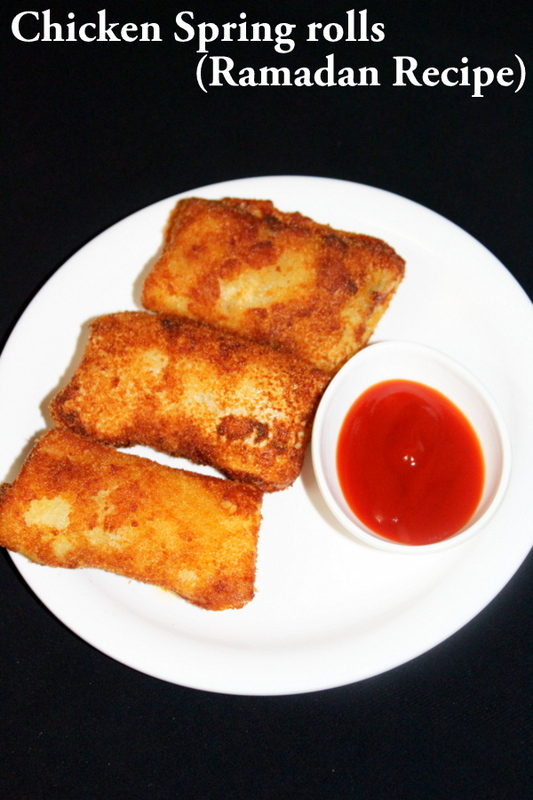 Below are the recipe details on how to make chicken spring roll recipe with chicken stuffing and home made sheets with detail steps and also a video procedure for a better understanding. I would suggest my viewers to please watch the video as the recipe goes in 2 to 3 steps and every step has to be watched carefully to get proper spring rolls. A Ramzan iftar snack made using boneless chicken, veggies as the filling and the sheets are made using maida and corn flour batter. Take 250 gms boneless chicken, clean and wash the chicken well. Take a pressure cooker, into it add the boneless chicken, salt, tumeric powder, some water. Pressure cook the chicken for 3 whistles on medium flame. Take the chicken out and make small pieces of chicken. Keep them aside for later use. Into it, add shredded onion, shredded cabbage, shredded carrots, shredded green capsicum. Saute these veggies for 3-4 minutes on medium flame. Add salt as per taste and saute well. Add the boiled chicken pieces, mix well. Stir fry the chicken pieces for few minutes. Add black pepper corn powder, soy sauce, tomato ketchup, mix well. Cook for a minute or two on low flame by stirring in between. Keep the filling aside for later use. Take a mixing bowl, add 1 cup maida/all purpose flour. Add corn flour, salt to taste, mix the ingredients well. Add water gradually and make a batter. Add more water if required and mix the batter. Mix the batter without any lumps. Take a gridle/tawa, heat the tawa. Take a ladle full of batter, pour it on the tawa at the centre, spread it as a pancake. Cook the sheet for few seconds and take the sheet out(no need to flip). Similarly, continue making sheets with the rest of the batter. Take each spring roll sheet. Pour the chicken stuffing/filling just below the centre of the sheet. Bring the other two ends over the fold. Give a fold again and seal it with left over spring roll batter. Similarly, make chicken spring rolls with the rest of the spring roll sheets. Now take each chicken spring roll, dip the spring roll in beaten egg, then coat the chicken spring roll with bread crumbs. Similarly, dip all the chicken spring rolls in beaten egg and coat them with bread crumbs. Drop the chicken spring rolls in oil. Deep fry them on low flame until they turn golden color on all sides. Take them out and place them on an absorbent paper. Serve hot with tomato ketchup!!! 1. There are also ready made sheets available quite easily in the market and one can make use of those sheets and yet make delicious spring rolls. 2. Always make sure the tissue paper absorbs all the oil as the spring rolls take in lots of oil and it is necessary to remove the excess oil.